Looking to do a little company research this summer? Whether you’re exploring a new industry at an internship, or just starting to think about different organizations, summer is a perfect time to dig in and do some research. We know that starting your research can feel overwhelming, so as a first stop we recommend checking out Glassdoor, a great resource to help you get some answers and insight. 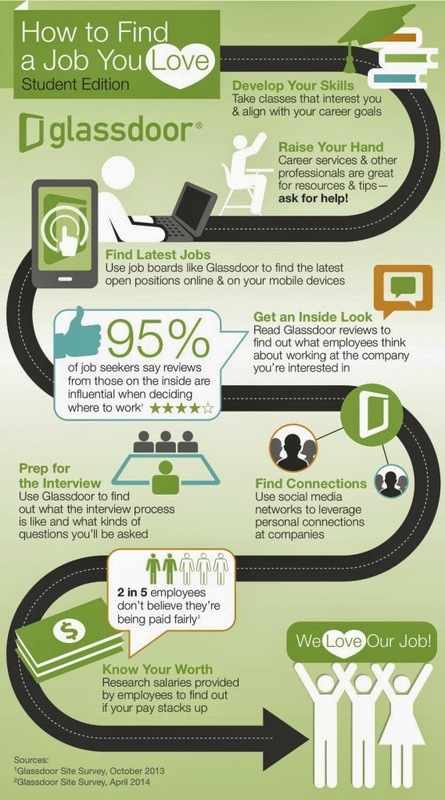 Glassdoor is a hub of information for the job seeker or the career explorer. Create a free account and investigate jobs, companies, and potential interview questions. It really is similar to getting an inside peak at a company before you even apply! Check out their website www.glassdoor.com to sign up today, and interact with them on social media. Here in Career Services, we love their daily updates, tips and tricks for landing a job, and even helpful infographics to get you started! Check out the one above for inspiration, and don’t forget that we are here to help you launch your professional brand all summer long! To schedule an appointment with me, call 277-3290. Kate Williams, Anderson’s Career Development Facilitator, is available to work one on one with you. Please call 277-3290 to schedule an appointment.